I am pleased to announce that a selection of my sea glass and sea pottery jewellery is now available at The Smokehouse Gallery in Eyemouth. Included in the collection is this pretty bezel set aqua sea glass pendant which was in the window of the gallery before I left! Yay! 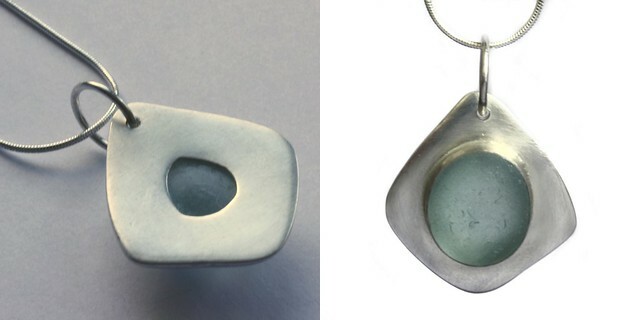 I will be adding new pieces to www.lauracameron.co.uk over the next few weeks including bezel set pendants on a made to order basis to start with. I really love this piece especially the way the light comes through the glass and hope to find more sea glass suitable for setting like this. Mum and Dad seem to be enjoying their trip and it's ace to have them around! We're going on a jaunt to the beach today so I'll see what I can find! Thank you so much for your comment on my blog last night! Congratulations on your new stockist :) It is always such a great feeling when your work gets to reach more people! I love the new pieces.